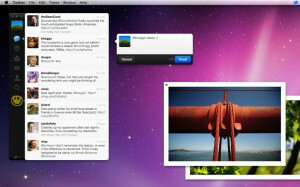 The app store’s arrival marks with the launch of twitter for Mac as tweetie is now upgraded as the twitter for Mac. The new version of twitter for Mac comes with an all new interface. This twitter for Mac comes with the real time update support, native re tweeting support and also an all new option which is to drag and drop the tweets and also many of them reported about that the URL shortening support is removed and now has been replaced with the default t.co which many of them didn’t like it. Its expected that in future, the Mac will bring a software update which will then also add the bit.ly API key support. Many of the functions which are there in the tweetie are missing in the twitter for Mac like U shortener is missing and also you cannot place the tweet box wherever you want, so every time you tweet, your tweet box will remain at the same place. Apart from the interface there is nothing to be loved for now at least as it needs many changes as well as many inclusions. Wile many would prefer to stay in tweetie and would be expecting the next version of tweetie that is probably tweetie 2, some will be waiting for the updated version of twitter for Mac. This app can be downloaded from the Apple Mac Store.